2. Sun Yat-Sen University Cancer Center, State Key Laboratory of Oncology in South China, Department of Experimental Research, Collaborative Innovation Center for Cancer Medicine, Guangzhou 510060, Guangdong, China. GSTT1 gene plays an important role in detoxification and clearance of reactive oxygen species(ROS). A null variant in this gene has been demonstrated to confer cancer susceptibility. Although many studies have demonstrated the association between GSTT1 null polymorphism and urinary system cancer susceptibility, several publications reported opposite conclusions. For better understanding the effects of this polymorphism on the risk of urinary system cancer, a updated meta-analysis was performed with a total of 26,666 cases and 37,210 controls extracted from 117 studies, by following the latest meta-analysis guidelines (PRISMA). The results suggested that the GSTT1 null genotype was significantly associated with an increased risk of urinary system cancer (OR=1.13, 95%CI=1.05-1.22). Furthermore, stratified analyses by the type of cancer, ethnicity, source of control and quality score presented a significantly increased risk associated with GSTT1 null genotype in bladder and prostate cancer subgroup, Caucasians and Indians subgroup, population-based(PB) subgroup, medium quality and low quality subgroup. Overall, our meta-analysis suggested that GSTT1 null genotype is a potential cancer susceptibility variant. Well-designed and large-cohort studies are needed to confirm the association between GSTT1 null genotype and urinary system cancer risk. Cancer is one of the leading causes of morbidity and mortality worldwide, with approximately 14 million new cases per year according to the World Cancer Report 2014. Exposure to carcinogens and harmful metabolites is one of etiologic factors for urinary system cancer[2, 3]. Cytosolic glutathione S-transferases (GSTs) are members of a phase II metabolic isozymes super family, which protect cells against electrophilic damage by catalyzing the conjugation between carcinogens and glutathione. This catalytic reaction decreases the toxicity of carcinogens and facilitates their excretion from the body. Additionally, certain GSTs also protect tissues against injury by attenuating oxidative stress or modulating the signaling pathways of cell proliferation, apoptosis and differentiation[4, 5]. The glutathione S-transferase theta 1 (GSTT1) is located on the long arm of chromosome 22 (22q11.23). Some studies reported that GSTT1 protein was involved in catalyzing the conjugation of ethylene oxide and halogenated metabolites. Moreover, GSTT1 is also involved in the activation of p38/MAPKAP kinase 2(MK2) signal pathway. GSTT1 may prevent cells from tumorigenesis via promoting p38/MK2-mediated apoptosis and senescence. High thiol levels and the absence of oxidative stress keep the GSTT1 in monomeric form. 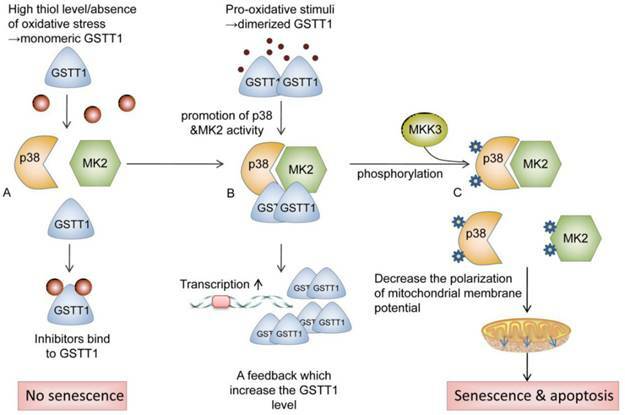 In the presence of pro-oxidative stimuli, dimerized GSTT1 bind to p38 and MK2 to facilitate the activation of these kinases, which in turn elevate the expression of GSTT1. After interacting with MKK3, Phosphorylated p38 and MK2 reduce the polarization of mitochondrial membrane potential, which activates apoptosis and senescence (as shown in Fig 1). Dysfunction of GSTs has been implicated in the development of bladder cancer, prostate cancer, or renal cell carcinoma, due to the defective detoxification capacity [9, 10]. The GSTT1 polymorphism (GSTT1 presence and GSTT1 null) has been proved in several studies to be associated with an increased risk of urinary system cancer[11-13]. However, the results from different groups were to some extent divergent[14, 15], which might be owing to the limitations of individual studies, including the heterogeneity in the sample source, study design or disagreements among the investigations. A comprehensive meta-analysis might provide sufficient statistical power to draw a more reliable conclusion on the association between GSTT1 null genotype and urinary system cancer risk. Therefore, we conducted the current meta-analysis using genotype data from 117 eligible studies to assess such association. The strategy of literature screening, data collection, and studies inclusion in this meta-analysis was according to the latest meta-analysis guidelines-Preferred Reporting Items for Systematic Reviews and Meta-Analyses (PRISMA). A systematic literature retrieval was performed using the following key words: "glutathione S-transferase T1 or GSTT1", "variant or variation or polymorphism ” and “bladder or prostate or renal cell carcinoma or urinary system cancer” through PubMed and EMBASE databases without any restriction on language (the last search update was performed on Nov 24, 2015). We further searched articles from Chinese Biomedical (CBM) and China National Knowledge Infrastructure (CNKI) databases to ensure more studies were include in this research. We also searched the references of the relevant literatures manually. All the eligible studies were listed in the reference. Schematic of the potential roles of GSTT1 in preventing cells from tumorigenesis. GSTT1 prevent cells from tumorigenesis via promoting p38/MK2 mediated apoptosis and senescence. High thiol levels and the absence of oxidative stress keep the GSTT1 in monomeric form. (A) Monomeric GSTT1 dissociates from p38 and MK2, and binds to its inhibitor. (B) In the presence of pro-oxidative stimuli, dimerized GSTT1 binds to p38 and MK2, promoting the activity of these kinases, which in turn elevate the expression of GSTT1. (C) After interacting with MKK3, Phosphorylated p38 and MK2 initiate the reduction of polarization of mitochondrial membrane potential, which activates apoptosis and senescence. Abbreviations: GSTT1, glutathione S‑transferase theta 1; MK2, mitogen-activated protein kinase-activated protein kinase 2; MKK3, mitogen-activated protein kinase 3. The inclusion criteria were as follows: (a) evaluated the association between GSTT1 null genotype and urinary system cancer susceptibility; (b) only case-control studies were taken into account; (c) with details for calculating odds ratios (ORs) and corresponding 95% confidence intervals (CIs); (d) presented in English or Chinese. If the study had overlapping subjects with others, only the most complete and latest one was included. The exclusion criteria were: (a) case only studies; (b)case reports; (c) conference abstracts; review articles; (d) non-cancer subjects only studies; (e)duplicate publications. Two of the authors (Y.W. and J.H.) independently extracted the information from all the eligible studies. While there was a disagreement between them, they made a discussion about the issue. If they could not reach a consensus, another author would participate to resolve the dispute, and authors would vote to make a final decision. Data extracted from each study were as follows: the surname of first author, year of publication, country and ethnicity of the subjects, case number and control number with the GSTT1 null, number of total subjects, source of control, genotyping method, and case confirmation approach. The types of cancer were consist of bladder cancer, prostate cancer and renal cell carcinoma. Ethnicities were categorized into Africans, Asians, Caucasians, Indians and Mixed (containing more than one ethnic group). The sources of control were classified as population-based(PB) and hospital-based(HB). The minimum number of patients was not defined for inclusion in this meta-analysis. Publications were divided into different categories by the type of cancer, ethnicity, source of control or quality score. The quality of the study was independently assessed by two investigators (Y.W. and J.H.) via the quality assessment criteria (Table S1)[17,18]. The evaluation factors were as follows: representativeness of case, representativeness of control, ascertainment of urinary system cancer, control selection, genotyping examination, and total sample size. Each research was evaluated on a scale from 0-15. If the score of one study was ≤5, it was classified as "low quality"; 5<scores≤10, "medium quality"; scores>10, it was categorized as "high quality". Crude ORs and the corresponding 95% CIs were used to evaluate the strength of association between GSTT1 null genotype and urinary system cancer susceptibility. The statistical significance of an association was determined by Z test. The between-studies heterogeneity was assessed and qualified using cochran Q-test and I2 statistic. For Q test, when P<0.10, the heterogeneity was considered statistically significant. I2 statistic represented the proportion of variants caused by heterogeneity across studies but not sampling error. In this meta-analysis, if heterogeneity was P>0.10 for Q-test, a fixed-effect model was applied; otherwise, a random-effect model was conducted. The leave-one-out sensitivity analysis was performed by excluding a study in the meta-analysis each time and recalculating ORs. Moreover, the publication bias was detected by Begg's and Egger's linear regression tests. The symmetry of the funnel plot suggested null publication bias; otherwise, the publication bias was present. Finally, a meta-regression was conducted to detect the main heterogeneity source among the studies included in our analysis. All statistical analyses were performed using the meta software package of STATA version 12.0 (STATA Corporation, College Station, TX). All the P values were two-side tests. P<0.05 was considered statistically significant. A total of 189 relative articles were obtained from CBM, CNKI, EMBASE and PubMed using search terms according to the search strategy in methods section. 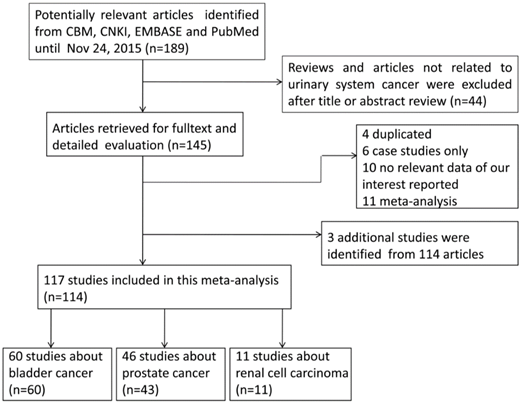 After screening the title or abstract, 44 articles that were either not related to urinary system cancer or reviews were excluded. The remaining 145 publications were carefully evaluated according to the eligibility criteria. Among them, 31 articles were removed because they were duplicated studies (n=4), not case-control studies (n=6), useless in GSTT1 genotyping data extraction (n=10) or meta-analysis (n=11). Therefore, 114 publications were subjected to further analysis. Among them, 3 additional studies were extracted from publications containing two studies[9, 17, 18]. For example, Steinhoff and his colleagues investigated the association of GSTT1 null genotype with both bladder and prostate cancer risk. Finally, 117 eligible case-control studies with 26,666 cases and 37,210 controls meeting the criteria were included in our analysis[9-15, 17-89] [90-123]. The flowchart of the identification of eligible studies was shown in Fig 2. Table 1 summarized all the eligible studies and main characteristics. The sample size ranged from 46 to 4,537 in the 117 studies, including 60, 46 and 11 studies focusing on bladder cancer, prostate cancer, and renal cell carcinoma, respectively. According to the race, these studies could be classified into 5 subgroups, Africans(68 studies), Asians(20 studies) , Caucasians(5 studies), Indians(10 studies) and mixed populations(14 studies). The majority of the patients(94%) with urinary system cancer were histologically confirmed, and 6% of the patients were determined by the medical records. Controls were frequency-matched to patients by age, gender and ethnicity in most of studies. Of all the studies, 49 studies were PB, while 68 were HB. Additionally, 19 studies were considered as low quality(score≤5), 79 studies were considered as medium quality(5<score≤10), and 19 studies were considered as high quality(score>10). Flowchart of included studies for the meta-analysis of the association between GSTT1 null genotype and urinary system cancer risk. BC, Bladder cancer; RCC, Renal cell carcinoma; PC, Prostate cancer; HB, Hospital based; PB, Population based. 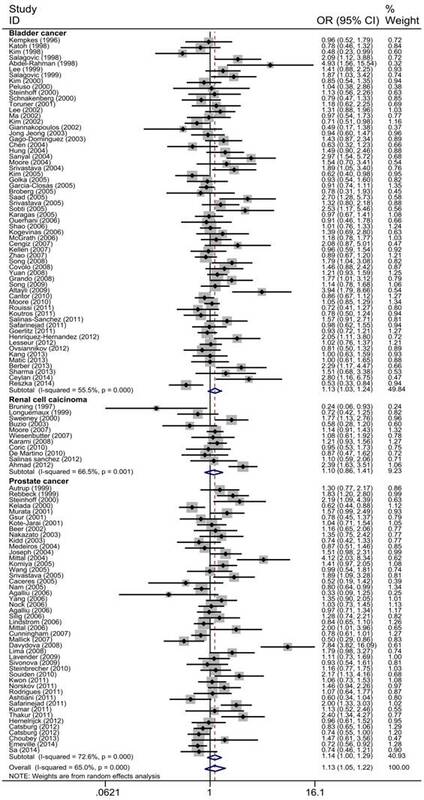 The main results of the meta-analysis were shown in Table 2, Fig 3 and Fig 4. Pooled analysis yielded a significant association between GSTT1 null genotype and urinary system risk (OR=1.13, 95%CI=1.05-1.22). In the stratification analysis by the type of cancer, significantly increased risk of bladder cancer and prostate cancer was observed with GSTT1 null genotype (bladder cancer: OR=1.13, 95%CI=1.03-1.24; prostate cancer: OR=1.14, 95%CI=1.01-1.29). Subgroup analysis by ethnicity revealed a significantly increased urinary system cancer risk for Caucasians and Indians (Caucasians: OR=1.16, 95%CI=1.05-1.27; Indians: OR=2.05, 95%CI=1.700-2.480). By source of control, a statistically significant association was confirmed in PB subgroup (OR=1.15, 95%CI=1.04-1.27). Moreover, when 117 studies were stratified by quality score, the presence of GSTT1 null genotype was associated with urinary system cancer risk in the low quality and medium quality subgroup (score≤5: OR=1.43, 95%CI=1.13-1.79; 5<score≤10: OR=1.15, 95%CI=1.40-1.26). Q test and I2 statistic were applied to assess the heterogeneity between 117 studies. There were considerable heterogeneities for the GSTT1 genotype and urinary system cancer risk in the overall analysis(P=0.000, I2=65.0%). Thereafter, we applied meta-regression to investigate the sources of heterogeneity by the type of cancer, ethnicity, source of control and quality score. As shown in Table 3, we found the ethnicity and quality of the study contributing to the heterogeneity in this meta-analysis (ethnicity: P=0.003; quality score: P=0.002), but not the type of cancer and source of control (the type of cancer: P=0.703; source of control: P=0.175). Forest plot of the association between GSTT1 null genotype and urinary system cancer risk. For each study, the estimates of ORs and corresponding 95% CI are plotted with a box and a horizontal line. Diamond, pooled ORs and its 95% CI. Forest plot of the association between GSTT1 null genotype and urinary system cancer risk which is straitified by the type of cancer. For each study, the estimates of ORs and corresponding 95% CI are plotted with a box and a horizontal line. Diamond, pooled ORs and its 95% CI. To detect the effect of individual data-set on the stability of the pooled analysis, we performed the sensitivity analysis by consecutively excluding a study at a time and recalculating ORs. As a result, there was no substantial change in the corresponding pooled ORs, suggesting that our analysis was statistically stable(Fig 5) . Sensitivity analysis of the association between GSTT1 null genotype and urinary system cancer risk. Each point represents the recalculated OR after deleting a separate study. 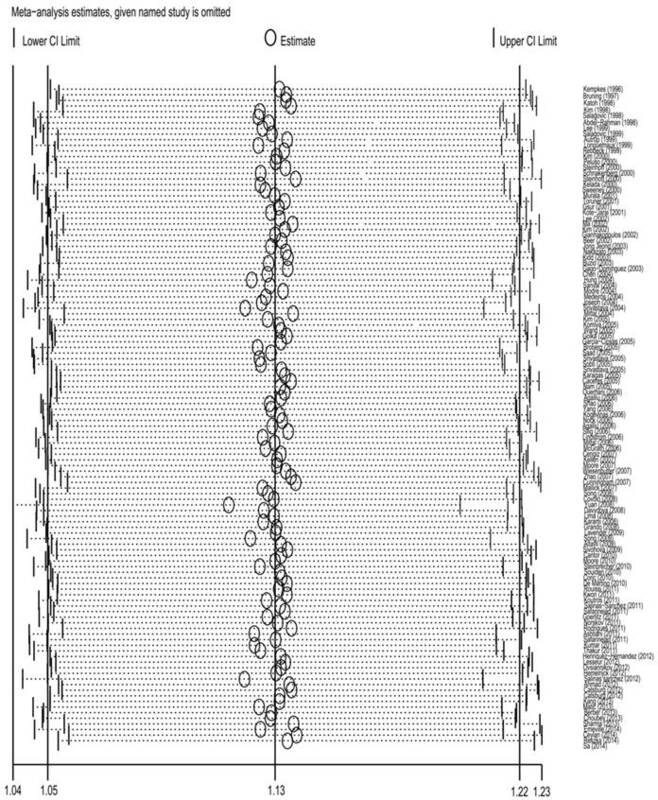 Funnel plot analysis to detect the publication bias for GSTT1 null genotype and urinary system cancer risk. Each point represents a separate study. Funnel plot of the Begg's test for (A) 117 studies, Z=3.03, P=0.002; and (B) for 98 studies after dropping 19 studies with low quality, Z=1.94, P=0.052. Begg's (Fig 6) test and Egger's test were conducted to assess the publications bias of 117 studies. 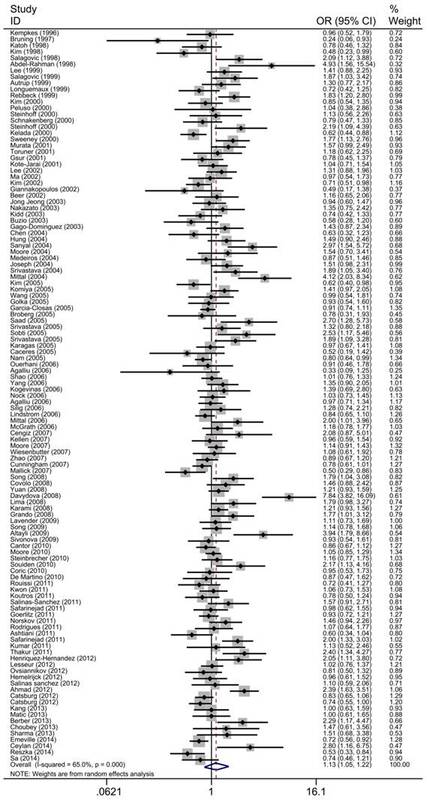 The results indicated a statistically significant evidence of publication bias in the meta-analysis (P=0.002). Interestingly, when we dropped the low quality studies with score≤5, publication bias disappeared (P=0.052). The data suggested that the bias might be caused by those studies with poor genotyping method or selectively reported positive results. This is a comprehensive meta-analysis for the relationship between the GSTT1 null genotype and the urinary system cancer risk. There were 117 studies with a total of 26,666 cases and 37,210 controls included. Pooled analysis suggested that GSTT1 null genotype was associated with a significantly increased risk of urinary system cancer. In the stratified analysis by the type of cancer , GSTT1 null genotype was shown to significantly increase the risk of bladder cancer and prostate cancer, but not renal cell carcinoma. Moreover, while stratified analysis were conducted by ethnicity, source of control and quality score, significant association were identified among Caucasians and Indians, PB subgroup and high score subgroup. So far, this is the first meta-analysis to evaluate the association between GSTT1 null genotype and urinary system cancer risk with the largest sample size of 63,876 subjects in this area. The GST super family belongs to phase II detoxifying enzymes. They catalyze the reduction reactions between glutathione and electrophilic substrates, producing stable and harmless compounds. Then these compounds are excreted or compartmentalized. GSTT1 gene is located on the long arm of chromosome 22 (22q11.23) and composed of 5 exons. Apart from the well-established roles in detoxification, each GST has specific function. For instance, GSTT1 is involved in p38/MK2 mediated senescence, and conjugation with small molecular-epoxides, which may attenuate the injury from inflammation to cancer progression. There is a null variant allele of GSTT1 gene, which results in an absence of GST enzyme activity and an increased risk to malignancies. Many studies were performed to evaluate the association between GSTT1 null genotype and the susceptibility to urinary system cancer. However, the results from different laboratories were not consistent. Numerous reports suggested that there was an significant association between GSTT1 null genotype and urinary system cancer[9-13, 20, 21], while several other studies failed to detect any association between renal cell carcinoma and GSTT1 null variant[114, 117, 118]. Some meta-analysis were performed to evaluate the association between GSTT1 null genotype and bladder cancer, prostate cancer or renal cell carcinoma, respectively, overall or in a certain population[126-129]. Our analysis included all the eligible studies regardless of the types of cancer like bladder cancer, prostate cancer or renal cell carcinoma. The results of the current meta-analysis confirmed a significant association between GSTT1 null genotype and the susceptibility of urinary system cancer. However, this variant was proven to significantly increase the predisposition to bladder cancer and prostate cancer in stratified analysis by the type of cancer, but not renal cell carcinoma. SNPs in a gene were typically cancer-specific. The discrepancy might owe to the inherent heterogeneity of oncogenic progression in different cancer. The stratified analysis by ethnicity verified that GSTT1 null variant significantly increased the urinary system cancer predisposition in Caucasian and Indian subgroups. Moreover, a significant increased risk was indicated in PB subgroup, but not in HB subgroup. This was probably due to that the controls collected from hospital were not capable of representing the general population, which might decrease the risk value. Stratification analysis also showed the heterogeneities of between-studies in the overall analysis. We further conducted the meta-regression to assess the factors contributing to the strong heterogeneities among overall analysis. The results suggested that the ethnicity and quality of the study were the main factors associated with the heterogeneities. First, cancer is a complicated disease induced by the gene-environment interaction. People born in different geographic areas has different genetic background and life style. There are different linkage disequilibrium patterns in different populations. Supposed that GSTT1 polymorphism is in close linkage with a causal mutation in Caucasians and Indians but not other ethnicity, the discrepancy can be explained. Besides, the effects from clinical features and live surroundings of different population should be well-contemplated. The second, studies with poor genotyping method and selectively reported positive results also contributed to the heterogeneities. Therefore, more studies are needed to investigate the heterogeneity in further research. Compared to the former meta-analysis, the current one might possess the following merits: (a) This meta-analysis included the latest studies till Nov, 2015 to make it more comprehensive and minimize the selection bias; (b) The study drew a more complete conclusion about GSTT1 null variant and urinary system cancer risk, but not only bladder cancer or prostate cancer; (c)This investigation conducted a systematical stratification and meta-regression analysis, which provided a more precise conclusion; (d)The sample size and study number were relatively larger, and the statistical power was more potent. However, there were some limitations in this meta-analysis which should be taken into consideration. First, the study number about renal cell carcinoma (n=11) or Africans (n=5) was small, compared to the studies about bladder cancer(n=60) or Caucasians(n=68). Because of the relatively small sample size, the stratified studies regarding renal cell carcinoma and Africans might have a lower statistical power to detect the substantial effects of GSTT1 null genotype on the risk. Second, not all the studies provided enough data about lifestyles (example, smoking, drinking alcohol or tea) or environmental exposure which were reported to be important for the development of urinary system cancer. Third, the selection bias was exist. When we dropped the low quality studies with score≤5, publication bias was not present. There might be a language bias, inflated evaluations or selectively reported positive result in studies of low quality. To summarize, this systematic meta-analysis regarding the relationship between GSTT1 null genotype and urinary system cancer indicated that this variant significantly increased the risk of urinary system cancer. Moreover, the significant association was found in bladder cancer, prostate, Caucasians, Indians, PB subgroup, but not in renal cell carcinoma, Africans, Asians, Mixed and HB subgroup. The well-designed, large-cohort and multi-center studies are needed to present more rigorous data to confirm our findings. This work is supported by the National Natural Science Foundation of China (No.81402090 to Y.W. ), the Colleges and Universities Natural Science Foundation of Jiangsu Province (General Program, 15KJB180017 to W.L.) and the Suzhou Science and Technology Program (SYS201540 to W.L.). All authors contributed significantly to this work, Y.W., J.H., T.M. and Z.S. performed the research design and data collection; W.L. and H.S. assessed the studies quality and conducted the stratified analysis; H.S., T.M. and F.L. did the sensitive analysis and publication bias test. Y.W. and J.H. wrote the paper and prepared Figure 1-6 and Table 1-3. All authors reviewed the manuscript. Moreover, all authors confirmed the final edition. Corresponding author: Zhen-Ya Shen, Department of Cardiovascular Surgery & Institute of Cardiovascular Science, First Affiliated Hospital of Soochow University, Suzhou, Jiangsu, China, email: uuzyshencom.